Holographic imaging , very spacious with incredible layering of music . Like another reviewer said it needs a good transport to get the maximum Fidelity, works excellent in upconverting cd quality (16/44) to 24/192 or 24-96 if you prefer . Highly recommended, I use mine with a Musical Fidelity NuVista M3 and the pairing is perfection to my ears . Would be nice if it had balanced connections. Transparent, timbrally and tonally accurate, while very Musical. Exceptional detail renders full bodied three dimentional images in a very large three dimensional space. Extremely dynamic with lots of sparkle. Astonishing quality of build and performance for the price. As far as value rating this rates a 10 instead of 5. Beautiful looking and very high Cool factor. All in all truely exceptional. Sensitive. Will require good , low-noise power conditioner, such as APC S15. Careful consideration needs to be given to isolation to extract best performance. Firstly, let me say that the nonsense review by the spolier Quikxotica is a joke and should be removed. What motived does he have in rating this product a one, when he only used it for a few days? Anyway, just wanted to say a few words about this excellent DAC. It most be said from the outset that I believe vinyl to be the ultimate format for coming the closest to the absolute sound. However I've heard and owned some excellent digital source gear (including several good CD players), and as far as DACs are concerned, this includes; CAL Audio Labs Alpha 96/24, Timbre TT, Sonic Frontiers SFD2 Mk2, Audio Research DAC 3, and Bel Canto DAC2 -perhaps not the Ne Plus Ultra of the high-end, but very good nonetheless. The Trivista DAC 21 has bettered all of these at bringing me closer to the music. Make no mistake this is an excellent DAC. At once highly refined, timbrally and tonally accurate, and at the same time very musical and 'alive'. this DAC is overbuilt to an astonishing degree considering its price. It is the proverbial 'tank' when compared to most other DACs I've owned and listened to. It is extremely well-finished and a very attractive component to look at. The feet have a very cool appeal as do the blue LEDs. People who complain of brightness are probably pensioners with failing eyesight who can;t stand any glare. My point is that this is a visually stunning piece to add to your system. The attribute that caught my attention immediately upon setting this up in my system, was the simply vast soundstage. The bounderies of my room melted away. I'm not talking only in terms of soundstage width and depth, but also of height. So many DACs and CD players fall short when it comes to conveying height accurately. What I also found noticable was the incredible level of detail; this DAC seems to extract every once of information from the disc. I just don;t think you can get much more out of a CD. This results in superb and very stable imaging, with performers and intruments having 'body' in the three dimensional sense - set on a very large three dimensional stage. This incredible detail also results in a sense of realism that is one of the best examples Ive heard from this medium. Listening to Sonny Rollins on Way out West (re-mastered 20-bit SXRD) with the Trivista being fed by the Wadia or Cal Delta, in turn feeding either my MFA MC Reference prototype preamp, Mark Levinson No 380s preamp, or the spectacular Spectron Model 10 preamp - in turn feeding two Levinson No 27s (as monoblocks), Audio Research Classic 150 monoblocks or 120 monoblocks, or Spectron 1KW amp connected with Transparent Ultra to the Monitor Audio GR60s or KEF reference 107s - one can literally hear every nuance of his playing, the intakes of breath, the spittle as it travels through the mouthpiece into the instrument, the very brassiness of the sax, and of course the extreme dynamics and transients as Sonny works his magic. This DAC is very transparent, which is noticable if your system is high-resolution as is mine. Along with this transparency comes a sense of aliveness, of sparkle, This is no doubt due to the tube design. You don't have to confine yourself to listening to CD on this DAC. It works wonderfully well with the Sirius Satellite radio I get with my dish network (you'd be surprised at the quality of Sirius radio). But with a decent transport (Wadia model 20 or CAL audio Labs Delta in my system) this DAC will reporduce sound with absolute fidelity - and beauty. To put things in context, I have to mention the retail price - which is absurdely low for the level of quality this DAC offers. There is no other DAC out there that comes close to the performance of this DAC at anywhere near the price. So, for your money, you will get very very close to state-of-art performance, and I've heard the best. Things are not all 'plain sailing' however, and I find this DAC very sensitive to power conditioning. Also, thought needs to be given to isolation. It is after all a tube design, with four (or is it five?) tubes - irregardless if they are milspec or not. All tubed electronics are suceptable to microphonics. All in all, on of the best DACs money can buy - at a steal!! In modded guise it images well outside of the speakers with good front to back layering of depth of image, dynamics are very good, timbre is faithfully reproduced. Like all good dacs it needs the best data, so a top transport is mandatory. I Don't have the circuit diagram yet, so I can't tweak more than the obvious. Hi, I bought this unit off ebay, the previous owner had fitted a remote control alps pot to the front, very handy, but sonic misery. I removed the alps with it's very thin wire loom and the sound improved enormously. After living with the Tri-vista for about 3 months, I went back to my old dac to compare and contrast, there was a metallic sheen when using the Trivista that I hadn't heard from my old 2 box dac, it sounded like my speakers had before I upgraded the caps to Hovlands. Armed with a soldering iron, I replaced the nasty ( cheap) coupling caps with some polypropylene caps , a very big improvement, I'm expecting similar gains, when I fit some new Hovlands. Back to the alps pot! I removed it and replaced it with a stepped attenuator, so that I could drive my power amp directly, another winner, really big bold sound. The next step on the ladder is to replace the 5532 op amps for better quality (ad825 or opa627). This is a very well thought out design , slightly hamstrung by some poor caps etc. This is a great DAC. I hear a lot more detail and a better soundstage. Compared to my Sony 555es, cd sound is MUCH better...more transparancy, better highs, more extended base, etc. Doesn't make CDs sound worse. Doesn't make CDs sound better. Expensive. Takes DAYS to warm up. Lights on front are absurdly bright. This unit did not live up to its hype or any of the glowing reviews that can be found in the hifi press. I returned mine 5 days after buying it. My experience: After letting this machine (which was already well broken-in since it was the dealer's demo) warm up in my system for 3 days, I did many hours of serious listening over a period of 3 more days. I used it with 3 different CD sources in my house (2 CD players and 1 DVD player). In each case, the difference between the sound with and without this DAC in place was minimal. Perhaps the music was very slightly smoother using this DAC. It was very hard to discern any difference at all. My cheap, ten-year old CD player still sounded like it always has, and my newer MF X-Ray V3 CD player still sounded great like it always does. Running the signal through this enourmous, heavy, expensive DAC made almost no difference at all. At least I got all my money back! Also, the blue LED lights on the front of this thing are WAAAAYY too bright. At night in a dark room, you could read a newspaper with only these lights. If you look directly at the machine it will give you a headache. I am not kidding. For less money than this DAC, you could buy a complete turntable & catridge rig and start having fun with music again instead of obsessing about all these digital transports and choke-regulated DACs that won't ever sound as good a new vinyl anyway. Just my 2 cents. Enhance you entire CD collection in one upgrade huh? You bet'cha!! - I had my Roksan Caspian MK1 for 5 years or so & my CD collection had grown a helluvalot in that time. 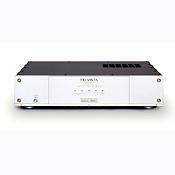 Looking for an effective upgrade to my front end meant dropping 4 grand or so on the latest players - till the Tri-vista DAC. I was sceptical as new players keep on coming out regularly, each promising to be the best of the best etc. so I treaded the course for my upgrade very cautiously!! On auditioning the Tri-Vista I was smitten! CD's I had known for years (especially ones from the early 80's) had sooo much air added to their soundstages, everything on all my discs seemed to have snapped into focus; treble higher and crisper, bass became crunchingly solid, voices hung in the air, distanced from their backing instruments. After all nite sessions getting reacquainted, annoying the neighbours etc. really brought home old friends, both old CD's and new releases by fave bands - I'm not talking about timing, jitter colouration etc. and other audiophile jargon: Just that visceral sensual feeling of being present at a live concert: Where cymbals are bright and crisp, bass gets you in the chest you hear voices break and undulate as the singer strains to hit a high note, ambience and all that other cool stuff, to a much, much greater degree than you may have been used to - that’s what I mean about the my CD's snapping into focus. I’ve tried it with all differing types of music from rap thru rock to classical world etc. and the Tri-Vista surprises with the sonic benefits it brings to each genre as it’s very even handed in it’s presentation whatever genre you are listening to. At the same time as my getting the Tri-Vista 21, I ended up selling my Roksan (still a good £900 player), to get a Sony ES standard player which was only sold for the Japanese market, a Sony CDP-X3000. It’s funny, as I have not once been tempted to listen to it on it’s own as a CD player. Thanks to the Tri-Vista, I know it’ll be disappointing and also the Sony does make a top-notch transport. If there’s any criticisms of the Tri-Vista 21, they are really minor: there’s only 2 inputs (1optical and 1 coaxial) and you can only have 1 in place at a time. I wish you could hook up various multiple digital sources to it at the same time & leave them in place like you do on an amp. Also, the damn things big. real big. Still, having said that, it looks cool and impressive if you can free up the real estate in your rack. Build quality and preformance:price ratio are superb. If like me, you don’t put much stock in SACD/DVD-A/Multichannel due to the limited choice of artists compared to 'ole CD and you want to get your existing CD collection to approach the resolution the new formats offer, then a superb DAC like the Tri-Vista 21 offers a VERY compelling solution. The Tri-Vista is a limited edition piece of equipment, if you can find one check it out, it more than gets my recommendation. While the new formats have come out and tried to crack the mainstream as the standard (or not as he case may be), CD has really come of age with products like the Tri-Vista. It'll be in use in my system till they invent something even better at the same price or cheaper (unlikely anytime soon, methinks) or they stop making new CD's. Whichever comes first is something I'm not sure of - In fact only thing I am sure of is that I'll have fun finding out!! !